Legislative Republicans are working to pass a bill to ensure that doctors provide life-saving care to infants who survive abortion. The bills, however, have been met with a Democratic blockade, despite heavy support from the party's base. Pro-life groups say they are monitoring each politician's position on the Born-Alive Abortion Survivors Protection Act and plan on publicizing the results for all constituents to see. March for Life Action, the political arm of the annual protest against abortion, said the treatment of the Born Alive Act will be a major driver in its annual scorecard for lawmakers. It will grade representatives just as harshly for blocking a vote on the bill as for an actual "No" vote. "We call on all Members to join the majority of Americans and recognize that a child born alive, even if she has been marked for abortion, has a right to life that should be protected," Tom McClusky, president of March for Life Action, said in an email. "Open hostility towards any pro-life legislation on the part of current House Democratic Leadership makes this necessary." Senate Democrats blocked the passage of Sen. Ben Sasse's (R., Neb.) proposed infant protections with only three Democrats joining the Republican majority. The Democrat-controlled House has refused to hold a floor vote on a similar bill. House Republicans are now campaigning for a discharge petition to rescue it from dying in the Judiciary Committee. Penny Nance, president of Concerned Women for America, said the legislation has exposed how radical abortion politics are for liberals. She pointed to the recent bipartisan measures banning food safety research that threatened the lives of cats. All four sponsors of the Senate bill, including presidential hopeful Sen. Cory Booker (D., N.J.), voted against protecting the rights of abortion survivors. She said voters would take notice of their indifference to vulnerable humans. "Any one lawmaker who shockingly cannot understand that babies are at least as valuable as kittens needs to pack up their offices and go home," Nance said. "Their moral compass is broken and their constituents deserve better representation." Terry Schilling, executive director of the American Principles Project, said support for abortion up until the point of birth and even beyond, could expose a major weakness for Democrats looking to appeal to moderates to retake the White House. Nearly 80 percent of voters, including 70 percent of self-identified Democrats, support providing care for newborns that survive abortion. He said the issue could especially hurt in the Rust Belt states that defected from the Democratic Party in 2016 and helped Trump's underdog campaign succeed. APP plans on making the Born Alive Act a centerpiece of 2020 coverage. 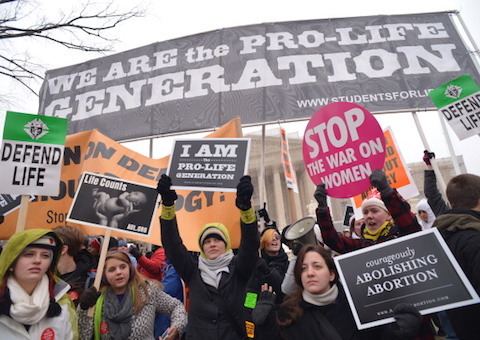 It sees an opening for pro-lifers to go on offense. "If you want to start winning in states like Ohio, Pennsylvania, Michigan, and Wisconsin, you're going to need to temper the radical nature of the abortion lobby," Schilling said. "It's a huge liability and the GOP is finally starting to understand the political reality and expose the Democrats for how extreme they are."